The Behn Quartet is formed by Kate Oswin, Alicia Berendse, Ana Teresa de Braga e Alves and Ghislaine McMullin, players from England, the Netherlands, Portugal, and Wales. Winners of the Charles Hennen First Prize at the Orlando International Chamber Music Competition 2017, they currently hold the CAVATINA Chamber Music Fellowship at the Royal Academy of Music, and have a Residency at the Wiltshire Music Centre where they are mentored by the Doric Quartet. They take their name from Aphra Behn, the seventeenth-century playwright, political activist, and philanthropist of the arts. Since their formation in 2015 the Behn Quartet have given recitals across the United Kingdom and abroad, including at the West Cork Chamber Music Festival, Norfolk & Norwich Festival, Leeds International Chamber Music Festival, and the Southbank Centre. They were honoured to premiere Sir Peter Maxwell Davies’ final work at his Memorial Concert in St John’s Smith Square and live on BBC Radio 3, and have recorded chamber works by Maxwell Davies, Stravinsky and Birtwistle for Linn Records. They have given concerts in association with the Concordia Foundation, ABRSM, and Pro Corda, and they were thrilled to collaborate with the Doric Quartet for a performance of Shostakovich Octet. 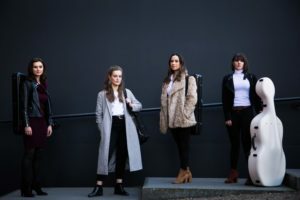 The Behn Quartet were also part of the official 40th Anniversary celebrations of Bohemian Rhapsody by Queen, performing a specially-commissioned ‘reimagination’ of the iconic song featured in news outlets worldwide, and praised by Rolling Stone Magazine as ‘a sweeping performance as grand as the original’. The Behn Quartet have been coached by Martin Outram and Levon Chilingirian, and currently study with Christoph Richter on the ChamberStudio masterclass scheme at Kings Place. They have received masterclasses from Lawrence Power, Hartmut Rohde, Peter Schumayer of the Artis Quartet, and the Fine Arts, Pavel Haas, and Vanburgh quartets. They also performed for the Takács Quartet in a masterclass on Beethoven at Wigmore Hall. Future engagements include their Wigmore Hall debut with thanks to the Maisie Lewis Young Artists’ Fund, the String Quartet Biennale Amsterdam, and will tour as 2018 Encompass Artists with Chamber Music New Zealand. They will make their Concertgebouw debut as part of the Orlando Competition Winner’s Tour, which will feature Sam Wamper’s ‘Portrait of Life’, for which they won the Special Honorary Prize at the competition for the ‘most beautiful performance’. The Behn Quartet are generously supported by Help Musicians UK, the De Lancey & De La Hanty Foundation, Le Dimore del Quartetto, and the CAVATINA Chamber Music Trust. The Quartet plays instruments and bows kindly on loan by the Royal Academy of Music and Hurwitz Fine Instruments. Recent heeft Ana Teresa de Braga e Alves de plaats ingenomen van Lydia Abell. Het Behn Quartet treedt op zondag 4 november 2018 op in de kerk van Mook.